It gets so tiring to watch professional politicians lie. I know we are used to it and thus we just give them a pass but until the issue threatens your life maybe you just won't understand my frustration. John Boehner does not deserve the job he holds. He has zero respect or consideration for people. Real people. People in his district and throughout this land. People who are losing their homes. People who are losing their cars. People who are becoming homeless. People who are filing for bankruptcy. All preventable. All unnecessary. All the fault of one man - John Boehner. Everyone knows that right now there are enough votes to pass the unemployment extension. There always have been. But because Boehner controls the House he is not allowing a vote to reach the floor. He claims like a broken record over and over again that it is for two reasons. First he claims it must be offset. Secondly he claims it must be tied to job creating measures. No matter how much he cries this mantra over and over again it becomes more and more transparent. Just another political ploy designed to try and shift the blame to the democratic side. After all, he has no real job security worries of his own. As long as his district likes him - to hell with the rest of the American people. He fiddles while the country burns. The stated reasons lack all sense of logic and fairness. First of all, extending unemployment pays for itself. The money goes right into the hands of those who will not save it or offshore it. People will spend it right back into the economy and the end result of that is actually more jobs to begin with. I do not need to rehash the voluminous amount of jobs already lost because of this man's depravity on this issue as it is well documented. The purpose here is not to provide statistics but to shame the one man responsible for more misery this year than anyone in this country. Even further highlighting the fictitious nature of the "must be paid for" excuse is the fact that just last week Boehner's House passed corporate tax cuts far in excess of the price tag for an unemployment extension without bothering to find an offset. This clear double standard only highlights that John Boehner is a liar and unfit for office. 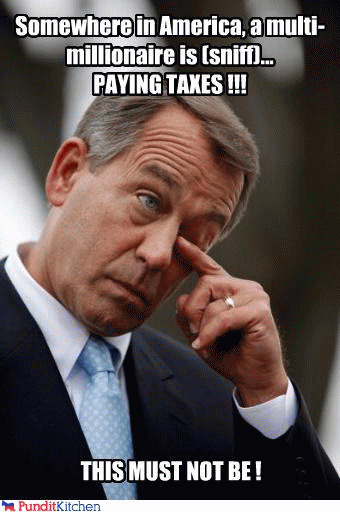 The second reason is the real poison pill for Boehner. This notion that in order to give people who have a proven work history a life line, that "job creation" measures must be attached. Never mind the jobs that get created just by passing the extension. This pill has never been about creating jobs. It was created to allow Boehner to balk at nearly any proposition regarding helping millions of people. His message to those in desperate need is clear - drop dead. If you believe that there needs to be better job creation efforts on the part of the federal government, terrific. Stop pretending it has anything to do with stopping the bleeding for millions of unemployed Americans. There have been hints that the Senate may attach the extension to the tax cuts. There still are the rumblings that the White House will veto unless it is attached. Both make sense. Boehner needs to show that he still has a sliver of a soul and let it happen. I honestly do not know how he can sleep at night knowing how he is destroying so many lives over what amounts to politics. Last week an Indiana many threatened to kill John Boehner because as he said, Boehner wanted to, "play with 2.7 million lives." While the man is clearly wrong for issuing such a threat it is completely understandable the frustration he feels. The fact is that Boehner is playing with millions of lives without seeming to care one bit about them. Speaker Boehner - it is time to stop playing with our lives. Do your job or give the gavel to someone who will. You can then slink back to Ohio and lie yourself to sleep pretending that you did something noble by destroying your fellow human beings.